In the fall of 1445, a German sailor named Steffen Smit and his crew, were caught in bad weather, and had no other option but to steer towards the port of Jæren, in Rogaland, Norway. They waited for weeks, without the weather giving any sign of calming down. But one day, they had some unexpected visitors. 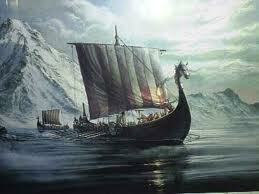 Erlend Eindridesson was one of the most respected men in Norway, and with him he had two ships and sixty men. He was known for his dislike of Germans. The Norwegian pirates threatened to steal their cargo. Smit, on the other hand, knew it would look bad for Eindridesson’s reputation if he stole from a German ship. The two countries were at peace at the time, and he had papers to prove his rights as a trader. Eindridesson let them be, but Smit knew it wasn’t over. At night, while no one noticed, Eindridesson and his men cut the ropes attaching the ship to the docks, and the ship was crushed toward it by the waves. At once, they insisted on helping the Germans, saving the cargo and bringing it to shore. Smit never saw the cargo again.